Technically advanced, environmentally conscious and incredibly comfortable, the Ellipse Long Sleeve Half Zip Hood is a hybrid-construction midlayer that uses strategically-zoned insulation for warmth and protection where you need it most. In the hood and chest panels, Icebreaker used their MerinoLOFT™ insulation, which provides a warm, breathable and natural alternative to synthetic insulations, with a recycled polyester face fabric. In the body and arms the Ellipse Long Sleeve Half Zip Hood features a super-soft and quick-drying blend of merino wool and recycled polyester with side stretch panels that actively manage moisture during cold, high-output days in the mountains or out on the trails. Zippered hand pockets and an internal stash pocket secure all your small daily essentials. 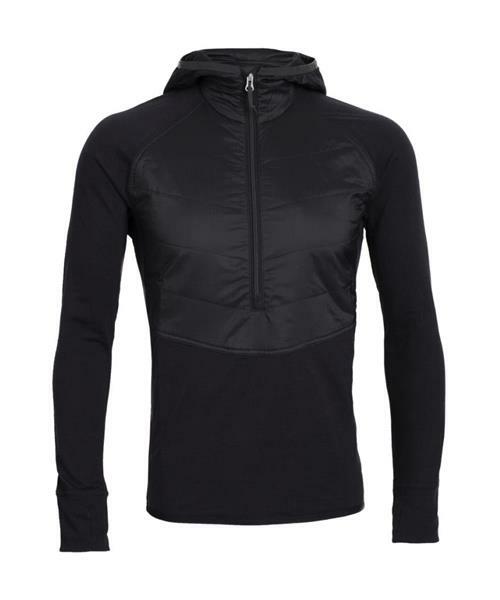 * Center back length: 76.5cm/30"
Ellipse LS Half Zip Hood - Mens is rated 4.8 out of 5 by 31. Rated 5 out of 5 by Ottawa613 from Half Zip -Full Warmth I layered a tech-fit t-shirt, this half zip long sleeve hood and the marino loft helix zip jacket (the light one) in -15 celcius mid day and i was operationally warm ( so long as i stayed at least walking pace no issue from the waist up!) reviews said it fit a bit tight so i went with XL im 200lbs - 6 foot and it fits great with plenty of room for base layers of various thicknesses. Nice product would recomend buying ur true size if u want the fitted look. Rated 5 out of 5 by heartNski from Perfect midlayer The merino wool is cozy and light with ideal natural stretch. Great size, tailored but not too snug. I'm 195 lbs, 6'0" and the Large fits well. Appreciated the close fit of the hood, and the body length is generous. Overall, a great piece of warm midlayer kit suitable for many activities! Rated 5 out of 5 by BrandonW from Great midlayer for all kinds of days Used mostly as a midlayer with a baselayer or undershirt at around 5-10 deg Celsius. Comfortable, the seams aren't bothersome in the arms like other wool garments. It can be too warm above 10 degs while inactive. My only gripe is the wrist openings are not more tailored, and are larger than expected, it's approximately the same diameter as the sleeve itself - kind of like a tube. Rated 5 out of 5 by hamibob from Top quality This is my third ice breaker hoodie. I wear them all the time. It is my pajama top in the winter. I use it for cycling, running and just general wear. They are awesome. Rated 4 out of 5 by Jlcjlc from Nice and comfortable but a little strange fitting I have the ellipse vest and thoroughly enjoy that so when this little number came on sale I jumped on the chance. Same great performance as the best but the shape or cutting seems a bit bizarre. It's a bit finicky to put overhead, leading one to believe it's too small, but once on the shoulders fit great but then most of the body is very loose even though I got a small. Rated 5 out of 5 by Mountainlover29 from Brisk Fall Run Ready This long sleeve is an awesome addition to an active repertoire. It's lightweight, warm, comfortable and breathes well. It is a solid layer for a crisp fall run, evening outside around the campfire or quick jaunt to the gym. I love the 3 pockets for my keys and music while I'm on the move and appreciate the thumb holes to help keep my hands warm on a cool day. The only thing I don't love is I find the sleeves a little loose fitting, but it isn't a deal breaker by any means. It's a worthy buy.